LONDON — The rally in global stock markets faded Thursday after U.S. and Chinese officials wrapped up three days of trade talks in Beijing without any significant breakthrough. KEEPING SCORE: In Europe, Germany’s DAX dipped 0.1 percent to 10,881 while France’s CAC 40 was 0.5 percent lower at 4,789. Britain’s FTSE 100 was 0.1 percent lower at 6,901. Wall Street was set for losses at the open with Dow futures and the broader S&P 500 futures down 0.4 percent. U.S.-CHINA TALKS: Stock markets have clawed back a lot of ground this year largely because of hopes of a breakthrough in trade discussions between China and the U.S. The lack of news following three days of talks in Beijing was used by many traders as an opportunity to book some profits reaped over recent sessions. Following the talks, China’s Ministry of Commerce said there were “detailed exchanges” and that both sides would “maintain close contact,” without offering specifics. And in a statement, the Office of the U.S. Trade Representative said negotiators will “report back to receive guidance on the next steps.” The talks come after President Donald Trump and Chinese leader Xi Jinping agreed to hold off on more tariffs for 90 days, on the sidelines of the G-20 summit in Argentina last month. Investors are hopeful that more and higher-level negotiations will follow. ANALYST TAKE: “Stock markets participants have been left a bit disappointed with the lack of a clear breakthrough in trade talks between the U.S. and China, after a three-day meeting merely laid the foundation for a potential deal in the future,” said Fawad Razaqzada, market analyst at Forex.com. AUTO JOB LOSSES: It’s been a bad day on the jobs front in the auto industry. Ford Motor Co. said it is cutting jobs in Europe as it reshapes its business to focus on more profitable commercial trucks and SUVs while shifting production to electric cars over the longer term. And Jaguar Land Rover said it will cut 4,500 jobs as the carmaker addresses slowing demand in China and growing uncertainty about the U.K.’s departure from the European Union. ASIA’S DAY: Japan’s Nikkei 225 index, which gained more than 1 percent on Wednesday, fell 1.3 percent to 20,163.80. 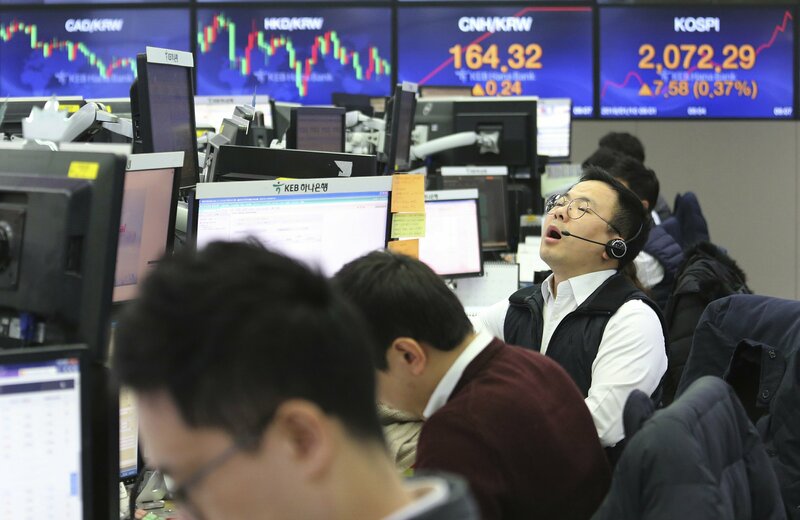 The Kospi in South Korea dropped 0.1 percent to 2,063.28. Hong Kong’s Hang Seng recovered from early losses, adding 0.2 percent to 26,521.43. The Shanghai Composite index lost 0.4 percent to 2,535.10.